Yellowstone National Park’s thermal features can be seen as the product of millions of years of geology at work. Much of Yellowstone sits inside an ancient volcanic caldera (the exploded crater of a volcano). The last major caldera forming eruption occurred 600,000 years ago. For hundreds of thousands of years following that, subsequent lava flows slowly filled in most of the caldera. Even now, in some places, nearly molten rock resides as little as 2-5 miles below the surface. Heat from the volcanic activity makes its presence known by heating ground water and creating the thermal features we now see. 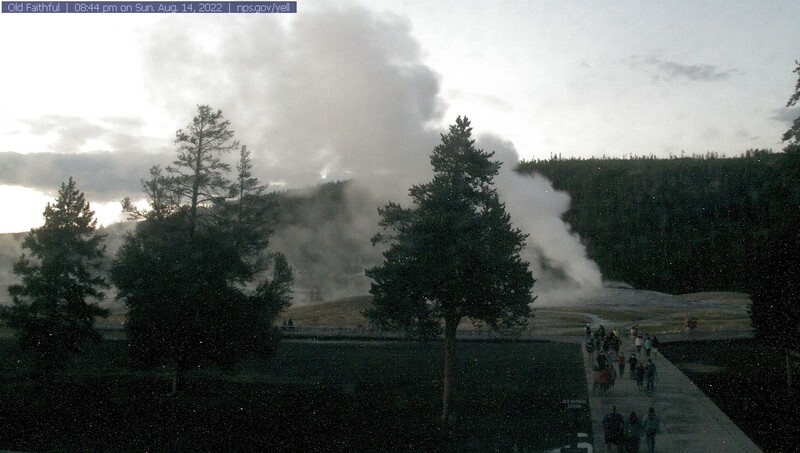 The four basic types of thermal features present in the Park are geysers, hot springs, fumaroles, and mudpots. Many of these are concentrated in Yellowstone’s major geyser basins: Upper, Midway, Lower, Norris, West Thumb, Shoshone and Heart Lake. Geysers are hot springs that erupt periodically. The eruptions is the result of super-heated water below-ground becoming trapped in channels leading to the surface. The hottest temperatures are at the bottom of these channels (nearer the hot rock that heats the water) but the deep water cannot vaporize because of the weight of the water above. Instead, steam is sent upwards in bubbles, collecting in the channel’s tight spots until they essentially become clogged, leading to a point where the confined bubbles actually lift the water above, causing the geyser to overflow. This causes the pressure to decrease until suddenly violent boiling occurs throughout much the length of the column, producing a tremendous volume of steam which forces the water out of the vent in a superheated mass. This is an eruption. As the eruption continues, the heat and pressure gradually decrease, and the eruption stops when the water reservoir is depleted or the steam runs out. The two types of geysers are fountain geysers (which shoot water out in various directions through a pool) and cone geysers (which shoot water out in a fairly narrow jet, usually from a cone-like formation). Hot Springs are similar to geysers, but their underground channels are large enough to allow rapid circulation of water. Rising hot water releases heat energy by evaporation or hot water runoff, while convection currents return the cooler water to the underground system, thus maintaining equilibrium. The microorganisms which live in and around the hot springs often make the pools very colorful. Fumaroles are holes or vents from which steam rushes into the air. It is like a hot spring, but lacks liquid water. Either there isn’t enough water or the underground rock is too hot and boils off all of the water so a pool can’t form. The small amount of water that does seep into the area is converted to steam and expelled from the vent, oftentimes creating a hissing noise. Mudpots are thermal areas where water-saturated sediment (similar to clay) is affected by super-heated steam below. Rising steam forces its way upwards through the mud and ground water, bursting upwards sending showers of mud into the air, as if in a small explosion. Steam Vents are cracks in the surface of the ground through which pressurized steam from below escapes to the surface, oftentimes with a hissing sound.